I have an acquaintance, whom we will call "Norway." Norway has the luscious locks of a Greek God. Imagine my surprise when I showed up to church one Sunday and beheld the freshly shorn scalp you see below. This past Sunday, we were conversing about how he has a doppleganger at the gym (he sees Gym more than I do) and I said, "He's even sporting a rockin' mullet just like you!" He immediately put his hands up and said, "Whoa, whoa...this is not a mullet! It's a Eurotail. Big difference." So I looked up "eurotail" online and all I could find was from Urban Dictionary: "European hairstyle that is gradually making its way into North America. A hybrid of a mullet and a rat tail but has remained socially acceptable. The eurotail lives life on one principle: work hard and enjoy life simultaneously." Mullet, Eurotail, whatever you call it, I don't see the difference. What do you think? 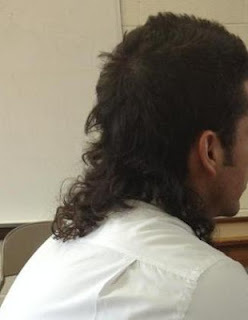 As a man who has sported a Euro-mullet (http://aasmyth.blogspot.com/2011/04/you-might-be-redneck.html), I can say that your friend can call it whatever he wants, but its awesomeness, or terribleness depending on your viewpoint, remains the same. It seems like only a connoisseur of mullets can distinguish between the two. yeeeeek... there are somethings that should just stay in Europe. Man tights and Eurotails are those things. If it looks like a mullet, and quacks like a mullet...it must be a mullet. That is seriously the stupidest haircut I have ever seen. But thank you for the laugh. I died! The mullet comes from the redneck side of town. The Eurotail, from the wannabe side. There's no way around it. It's still business in the front, party in the back. Maybe ask him if he can define the small line seperating the two hairstyles. I'm actually curious the find out the different ways of cutting the two. I'm pretty sure if you asked a hairstylist, she'd cut them both the same way but charge twice as much for the euro-do because she'll say it's "French", the wannabe will buy it and then tell all his friends he's on the cutting edge of fashion, they'll believe him and follow suit the next week but will still be made fun of as wearing a mullet ten years down the road.